U.S. Secretary of State John Kerry walks in the garden of the Beau-Rivage Palace hotel during a break in Iran nuclear talks in Lausanne, Switzerland, on April 1, 2015. They’re still talking in Lausanne, but it’s not looking promising. 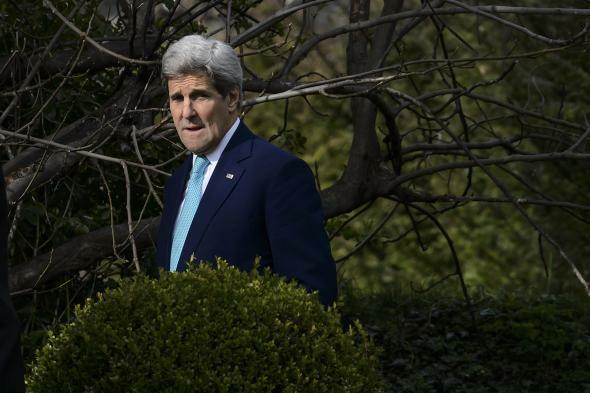 U.S. negotiators including Secretary of State John Kerry will remain in Switzerland until at least Thursday morning in hopes of reaching a deal on Iran’s nuclear program, according to the State Department. “We continue to make progress but have not reached a political understanding,” said spokeswoman Marie Harf. Wednesday’s round of talks was already in overtime after the negotiators passed a March 31 deadline without a deal Tuesday night. Kerry, whose last meeting with Iranian Foreign Minister Javad Zarif on Wednesday lasted just 10 minutes, evidently still hopes to be able to cobble together a preliminary deal, the details of which would be hammered out in June. The sticking points for a deal include the pace at which international sanctions on Iran will be lifted, the length of the agreement, and the number and sophistication of centrifuges Iran will be allowed to maintain. Another dispute emerged over the weekend when Iran’s deputy foreign minister said Iran had no intention of shipping its nuclear fuel stockpile out of the country, which it had tentatively agreed to last fall. In one ominous sign, three of the P5+1 foreign ministers—from China, Russia, and France—have left Lausanne, leaving their subordinates to join Kerry, British Foreign Secretary Philip Hammond, and EU High Representative Federica Mogherini at the negotiating table. * The Iranians are saying this should not be read as a sign that the talks are collapsing, but foreign ministers don’t generally like to miss a potential photo-op this big. Update, 4:15 p.m.: Barbara Plett of the BBC reports that French Foreign Minister Laurent Fabius is heading back to Lausanne. Maybe this isn’t over quite yet. *Correction, April 1, 2015: This post originally misspelled British Foreign Minister Philip Hammond’s first name.